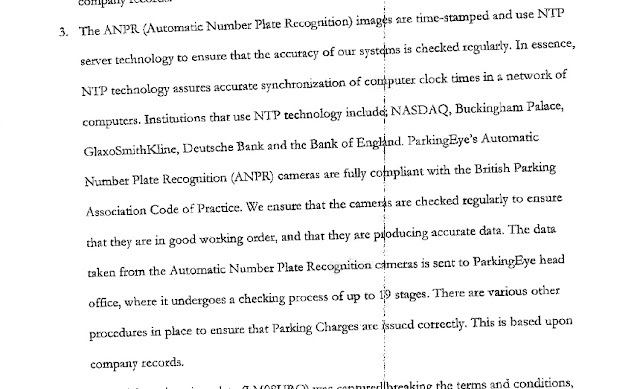 I am starting this thread with a view to gathering evidence that supports the Prankster's assertions (here: http://www.parking-prankster.com/anpr-technology.html) that ANPR cameras in car parks have fundamental flaws that make them unfit for purpose. If you find any similar articles (old or new) please resurrect this thread and put them up. Here's a starter for 10 in which the operator openly admits that in some circumstances number plates can be missed. A FATHER who took his children for tea at McDonald’s was hit with a parking fine for having supposedly stayed for more than four hours. In fact, Ian Gibson had visited the Arnison Centre retail park, near Durham City, twice during the same day – the first time to buy flowers for his mother-in-law. Horizon Parking’s CCTV cameras apparently failed to spot him leaving – and sent him a £40 fine, rising to £80 if it was not paid within 28 days. When the 60-year-old appealed, the Essex-based firm enraged him yet further: suggesting he may have been tailgating or speeding as he left. “I just can’t understand it. They got a photo when I first went in. Surely they must have got one of me leaving,” he said. Mr Gibson, who lives in Warrington, Greater Manchester, was visiting family in Durham on the day in question, Friday, October 9. He visited Marks and Spencer in the morning and McDonald’s early in the evening. But, he says, he has a bank receipt proving he was in Chester-le-Street at lunchtime. Horizon has agreed to cancel the fine, but in an email to Mr Gibson said: “Having checked our records, we can see no evidence of a multi visit on our system. Mr Gibson said: “I don’t tailgate or speed. I’ve written to them asking for £30 for my time. “I’m happy I haven’t got to pay £40 but I don’t trust going in their twice in one day now. Horizon did not respond to The Northern Echo’s request for comment. Parking rules at the Arnison Centre hit the headlines in 2013, when it emerged so-called shopping spies from another firm, UKCPS, were fining unknowing customers £100 a time for parking in one part of the car park and shopping in another. We can’t convince ParkingEye that two separate visits don’t count as one! I was furious when separate visits in the same car on the same day to an Aldi store on Nantwich Road near Crewe, in Cheshire, led to a parking charge notice from ParkingEye for £70. The maximum stay there is one-and-a-half hours. My wife arrived first at 10.39am and left at around 11.30am (after spending £19.14 on groceries). I drove the same vehicle into the car park at around 4pm and left 10 minutes later. No purchase was made at that point, as I only called in to inquire about a fridge. I returned at approximately 4.30pm in a campervan (a more suitable vehicle) and bought the fridge assisted by a member of staff. There is obviously an assumption that the vehicle leaving at 4.10pm had been there since 10.39am. The charge has cost two hours of my time rummaging through a recycling bin to retrieve the relevant receipts to prove the times of the visits. Aldi’s car parks throughout the UK are managed by ParkingEye, and although the retailer encourages its shoppers who have been slapped with what they consider to be an unfair charge to complain directly (customer-services@aldi.co.uk), talkboards have been full of complaints about the mailbox being full up. The time limit for free parking has also gradually been reduced and an hour-and-a-half is not long, particularly for older and infirm shoppers. In your case, Aldi and ParkingEye have acknowledged that there was clearly a mix-up. An Aldi spokesperson said: “Our car parking system is set up to ensure that we can offer customers maximum car parking space. This includes preventing non-customers from misusing spaces. Aldi does not make any revenue from parking notices. Alexander John Owens LLB is an ex-senior investigating officer with the ICO (Information Commissioners Office), and is the same 'Alec' Owens who testified before the Lord Leveson inquiry on Operation Motorman. You would therefore expect him to be something of an expert on data protection. Several months ago he helped a colleague who visited a service station twice but was issued a parking charge by ParkingEye for one long stay. He advised the colleague to write to ParkingEye, explain what happened and bring to their attention this obvious technical error with their system. He also expected ParkingEye to rectify the problem to ensure it could never happen to any other innocent motorist. The charge was duly withdrawn. More recently his daughter experienced the same issue. She regularly travels past Welcome Break Charnock Richard-Chorley in the morning and often pulls in for a coffee or petrol. She was therefore distressed to receive a parking charge notice accusing her of staying for over 48 hours at the services. Obviously ParkingEye's systems had failed again. This is a fundamental problem with ParkingEye's ANPR systems compounded by their failure to use industry available methods to prevent this happening. Numberplates can be misread for many reasons, including good weather, bad weather and ParkingEye's systems inability to cope with the position of numberplate fixings. The most common reason for failure is a close following vehicle which obscures the numberplate. This example from a ParkingEye charge notice illustrates how it happens. If the following car was a bit closer, the numberplate would have been obscured and its entry missed out. The same would have happened if the car in front was a van or lorry - the straighter back would cut out the last few letters of the plate. This is especially prevalent at service stations where vans and lorries are more common than at for instance retail shopping car parks. Essentially the problem is caused because the cameras are not high enough, and are not pointed down at a steep enough an angle. The higher the camera, the less chance the vehicle will be obscured. Of course, it still could be obscured. The ultimate solution, as used at Bristol Airport drop off, is to use barriers on entry and exist that read the numberplate before the barrier raises. However, barriers are not practical in all situations. A cheap and easy alternative is to bury an induction coil in the road and take a series of photographs each time a vehicle passes, whether or not a numberplate has been read. This would provide a failsafe record so that parking company employees could check these photographs and not issue a charge if any doubt is present. ParkingEye are of course well aware that their systems have a problem. They record instances of vehicles arriving without apparently leaving and leaving without arriving. These are caused by failing to detect either an entry or exit. The number of these mismatches gives ParkingEye an estimate of how good or bad their system is at each site. Large numbers of mismatches mean the cameras are faulty or badly positioned. The Prankster has previously reported on a victim accused of staying a long time in a car park. They withdrew the charge when the victim send them the tracker data from their vehicle, proving it had visited twice. The Prankster has also reported on a victim issued a ticket for arriving at a service station on one side of the motorway and leaving on the other! Despite knowing their systems are faulty ParkingEye continue to issue charges and even pursue victims to court. In their court documents they try and obfuscate matters and bamzoole the judge by referring to the accuracy of the timestamp. Of course ParkingEye are well aware that the accuracy of the ANPR timestamp is not the issue.The problem is the missed numberplates. Although ParkingEye refer to 19 stages of checking not once have they explained exactly what these checks are, or how they help with the problem of missed numberplates. The 19 checks do not appear to be particularly robust. The Prankster has helped with one case where ParkingEye told POPLA that a motorist had only visited once. POPLA believed ParkingEye and refused the appeal. However at the letter before claim stage they claimed the motorist had visited twice. After pointing out this failure in their 19 stages of checking, ParkingEye dropped the charge. No doubt many other innocent motorists without the Prankster's help would have caved in and paid the charge. The situation therefore is that ParkingEye are both negligent and reckless when they apply for keeper data from the DVLA in the full knowledge that their systems are faulty and that they have done nothing to prevent these errors. These are offences against the data protection act. Mr Owens therefore wrote to ParkingEye, and will be lodging complaints to the DVLA and ICO. His letter follows. Mr Owens obviously knows a thing or two about data protection. The Prankster therefore advises other motorists whose data has been recklessly accessed when it should not have been to consider following his lead and complaining to the ICO and the DVLA. They should also consider requesting compensation from the operator under section 13 of the Data Protection Act 1999. Now that Mr Owens has informed the DVLA of the problem, they will be similarly negligent and reckless if they keep issuing keeper data for ParkingEye queries without putting checks and balances in place. The problem is not confined to ParkingEye or to ANPR systems. ANPR Ltd, who have since been expelled from the British Parking Association, have been known to request keeper data and pursue the keeper even when the driver has previously written to them confirming they were the driver and giving their address. In that circumstance there is no legal reason to request keeper data because the keeper is not liable for parking charges if the driver name and address is known before proceedings begin. The problem is also not confined to BPA (or ex BPA) members. Parkshield Collection Ltd, an IPC member, also have form for pursuing the keeper when the driver is known to them. This is an offence under the IPC code of practice which can result in 6-12 sanction points. A motorist has been left furious after receiving a £100 car park fine in Gloucester when she wasn't even in the county at the time. Amantha Squire, who works in Gloucester, has visited the Tesco store in St Oswalds Road several times after finishing work to buy a few things for dinner, staying no more than 30 minutes at a time. Last month she received a penalty notice from the car park operators at the store claiming she had flouted the parking rules by staying almost 11 hours longer than the three-hour maximum. 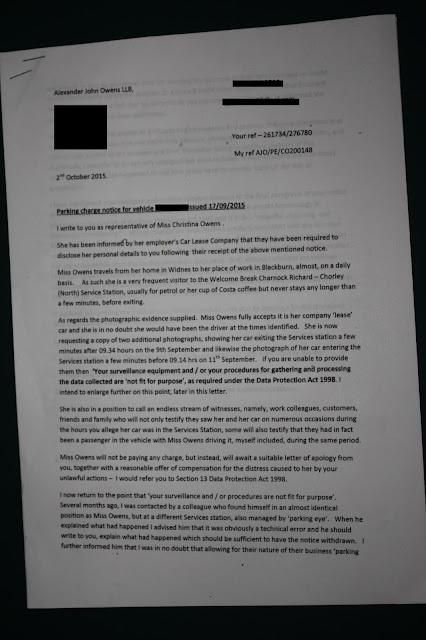 The letter included pictures of Ms Squire's vehicle entering the car park at 6.01pm on Monday, July 6 and leaving it at 8.04am the following morning – a date when she claims she wasn't even in the county. "I was actually at a work course in Warwickshire that week – having left my home in Bristol on that Monday – so there was no way my car could have been at Tesco let alone for 14 hours," said Ms Squire. "There's clearly a glitch with the system but it could have been very problematic for me with my partner asking me why I was parked overnight in Gloucester when I had told him I was at a work course in a different county. "It's absolutely appalling that this kind of mistake could have happened." Ms Squire has had to go back to get evidence from her work and the hotel where she stayed that week in order to appeal the fine. "It's outrageous that I have to do this when it was clearly their mistake," she added. A Tesco spokesman said: "We apologise for the inconvenience that Ms Squire has experienced and we are investigating the matter." Karen Slingo from Guiseley had a parking tricket cancelled with with a parking enforcement company over a £100 ticket she was given at Gusieley retail park, thanks to the YEP. A PARKING enforcement company performed a sudden U-turn when the YEP questioned why a Leeds grandmother was handed a £100 fine for visiting a FREE car park. Karen Slingo, 55, said she parked at Westside Retail Park on Leeds Road at Guiseley for around 20 minutes while shopping in the morning of July 3 and returned for a few minutes to buy a coffee at the McDonald’s drive through just before 5pm that afternoon. Mrs Slingo, of Guiseley, was shocked to receive a £100 parking ticket in the post five days later, which stated her car had been caught on camera breaching the three-hour limit for free parking at the retail park on July 3. She wrote to parking enforcement company Parking Eye to explain they had made a mistake. Mrs Slingo received a letter back on August 6 saying there was no evidence to to substantiate her claim and that the parking fine still stood. Mrs Slingo, who works as a carer, said: “I was appalled. I don’t mind paying if I’ve done something wrong, but this could have been an old person they were chasing for payment of a wrongly-issued fine. A Parking Eye spokesman said: “It appears that the vehicle registration was mismatched due to the position of one of the ‘bolts’ that affix the plate to the vehicle. Break the rules in a council run car park, or on a public road, and you can be fined by the local authority or police. Break them in one of the many car parks run by private companies, and you'll be hit with a charge – which can be for a higher sum. They don't have any legal powers to prosecute - but a new legislation in England and Wales under the Protection of Freedoms Act which banned wheel clamping on private land, has also made it easier for them to pursue car owners for payment. Those companies demand that we adhere to strict terms and conditions if we want to avoid their parking charges, so it’s a pity some of them seem to be ignoring their own industry rules. Richard Couzens parked his car in a car park near Cavendish Retail Park on a shopping trip with the family. He purchased a ticked which would allow him to park for an hour. Although he returned to remove the car after 40 minutes, two weeks later he was surprised to receive a parking charge notice from Excel Parking. Richard assumed there’d been a simple error with Excel’s automated systems. And as he’d kept the ticket which proved his case - he thought getting them to drop the charge would be just as simple. According to the Industry’s Code of Practice, issued by the British Parking Association (BPA) companies or landowners are required to acknowledge or reply to a motorist’s appeal within 14 days of getting it. If they send an acknowledgement, they must fully reply in writing within 35 days of getting the appeal. And only companies who are signed up to that code can buy your details from the DVLA - Excel was in clear breach. Last month the DVLA suspended Excel’s access to their database for three months because of another breach - issuing misleading information to drivers. Luckily for Richard he had his parking ticket and could prove his innocence, but the situation could have been different, leaving him £40 out of pocket. The DVLA has also suspended five other companies for issuing misleading information to drivers. “We take the management and the control of our data extremely seriously. But we also have to strike a balance in terms of the data that we provide to organisations that have reasonable cause to have that data...” Says DVLA spokesperson Phil Bushby. While the DVLA have taken action, these companies are still members of the British Parking Association – the body that’s in charge of the Code, and which is supposed to regulate the industry. Premier Park Ltd is also a member of the BPA. They issued Ian Peat with a parking charge without him even parking. Ian Peat had gone the wrong way on a holiday in Cornwall. The first port of call for him was to use the car park he saw on the side of the road to turn around. He was in and out of there in around 3 minutes - He received a ticket. Despite the BPA code saying that parking companies should allow drivers a reasonable “grace” period to leave without actually parking – Ian received a £60 charge after just three minutes. Premier Park said he’d entered a restricted area. And Ian noticed that the charge soon began to rise, with a threat of reaching £150 if he didn’t pay within 28 days. Ian says he thinks it is ridiculous. Ridiculous maybe, and arguably against the BPA Code. So while the DVLA are finally starting to take action – when will the BPA? We haven't issued any misleading information to drivers that breaches the CoP, neither does our signage breach the CoP. We can confirm that Mr Couzens was issued with a Parking Charge Notice (PCN) in relation to a visit he made to the Cavendish Park Retail Park on 29th April 2012. The PCN was issued because he did not purchase a valid Pay & Display ticket. The Cavendish Retail Park Car Park is monitored by Automatic Number Plate Recognition Cameras (ANPR) linked to Pay and Display machines which match “in” and “out” images against the records of Pay & Display (P&D) tickets purchased using the Vehicle Registration (VR) Number. It is important that the full and accurate vehicle registration number is entered at the time the ticket is purchased. Instructions are detailed on the P&D machine and tariff sign. Mr Couzens appealed against the PCN and produced copies of the 2 P&D tickets he had purchased; his appeal was received on 17th May at 21:00 hours via email. At the time of reviewing Mr Couzens appeal, we identified the reason why the PCN had been issued. In effect, Mr Couzens inputted an ‘O’ (Oscar) as part of his registration plate upon the purchase of his first Pay and Display ticket when the actual reference was to a ‘0’ (Zero). The correct registration was inputted with the purchase of Mr Couzens second Pay and Display ticket. The system processing matched the 2nd ticket only as this was an identical match to the correct VR number captured by the ANPR camera. In doing so, the (gap) between Mr Couzens entering the car park and purchasing this valid P&D ticket was 38 minutes, which significantly exceeded the grace period required to purchase a ticket and, hence, resulting in the issue of the PCN. However, we do recognise that motorists may input an incorrect digit(s) of their VR number when purchasing a P&D ticket and as such our processing allows for a manual review/quality check of PCN’s before they are issued. Unfortunately, on this occasion our check failed to identify the 1st ticket. On further investigation Mr Couzens case raises an unusual set of circumstances, as Mr Couzens purchased a 2nd ticket and left the car park almost immediately, even though the 1st ticket was not due to expire for a further 26 minutes. The issue was discovered at the point we reviewed Mr Couzens appeal and we duly placed the PCN on hold pending formal cancellation. The actual cancellation paperwork was drawn up on the 23rd of May for the cancellation of Mr Couzens PCN. On the same day incorrect correspondence was sent to Mr Couzens advising him that the PCN was being investigated. This correspondence should have stated that the PCN was being cancelled. It is with regret that Mr Couzens was sent a standard acknowledgement letter rather than a cancellation letter explaining the position to him. Furthermore, we are embarrassed to find that despite further correspondence received from Mr Couzens, we did not process it in the manner that it should have been. Mr Couzens also states within his correspondence that he has incurred an administration fee by his company for the issue of the PCN. We will therefore be offering Mr Couzens the value of the £40.00 Parking Charge Notice to cover both his fee and out of pocket expenses. We take customer complaints very seriously and have initiated an internal investigation and appropriate action will be taken to rectify the situation. Additionally, we are re-reviewing our complaints escalation procedure. As established members of the British Parking Association Approved Operator Scheme, we are committed to delivering high levels of customer service and we can assure you that the instances of poor standards of service experienced by Mr Couzens are very rare indeed. Premier Park Limited complies fully with all current legal and voluntary requirements set out for the Private Parking Sector. Mr Peat contacted us by telephone on the 27th September and he confirmed that he had entered the private land in question and that he was the driver. He also stated that he was unhappy to have received the Charge Notice regarding this. He was advised during this call that there are certain procedures we are required to follow and that he had the right to appeal the Parking Charge Notice and formally notify us that he was the driver at the time. In addition to this information being stated on the Charge Notice issued, he was further advised of the appeal process. To date we have not received any appeal or notification in writing or by email from Mr Peat regarding this matter. The British Parking Association’s Code of Practice states that operators must allow the driver a ‘reasonable grace period’ in which to decide if they are going to stay or go and a ‘reasonable period’ in which to leave the car park. The British Parking Association is now investigating the allegations made by Watchdog regarding Excel and Premier Park Ltd. There was a concern raised by the DVLA in late August 2012 in respect to wording on signage in place at a very small number of the sites managed by Combined Parking Solutions and as a result, and in line with their rights as the data holder, our access to the DVLA database was suspended until the matter had been rectified to the satisfaction of the DVLA. Combined Parking Solutions has never received any complaint or comment from any member of the public in relation to our signage which is very clear and sets out, in plain English, the terms and conditions for parking at any of our sites. This is evidenced by our high compliance rate and the fact that on each occasion we have taken unpaid charges to court, at the hearing, the wording, design and structure of our signage has been reviewed by the Judge and deemed to amount to a legally binding contract. The issues that DVLA raised were solely around the possible interpretation of a keeper liability statement and once Combined Parking Solutions were informed of the wording issues we took immediate and appropriate action to resolve these concerns. Following the matters raised by DVLA, Combined Parking Solutions have been audited by both the BPA and the DVLA and neither organisation have found issue with our amended practices and signage. In addition we even invited local trading standards to visit us and review all our documentation and procedures to which they did recently and no problems were identified. Combined Parking Solutions do not request data via the electronic link and wait 28 days following the issue of a charge before making a manual request for keeper details from DVLA, we can confirm that we are able to request keeper details for all unpaid parking events from 2nd November 2012. My father received a letter from this company informing him that he had not paid for a parking ticket. My father had paid the maximum amount of £3.00 for his time at this Hospital. He also has the ticket which fortunately he had kept ! The ticket he purchased clearly states the date and time. The letter from Highview is totally unacceptable. My father has just started to drive after suffering a ruptured Abdominal Aortic Anueyrsym, he is lucky to have survived. To receive this demand when payment has been satisfied is totally unacceptable. I feel they should offer apologies and compensation as my father has been very upset over this. THIS is the controversdial fine notice sent to a Newbury shopper, demanding £100...supposedly for parking in a free car park. The ticket was issued by a private parking enforcement firm, Sheffield-based Vehicle Control Services Ltd, and clearly states that Janis Clanchy, of Newtown Common, is being penalised for overstaying at “the privately-operated car park at London Road Retail Park, Newbury”. There’s just one problem – the car park is free and there are no restrictions, signs or cameras. Mrs Clanchy and her husband Doug initially assumed she had been fined because she visited several stores at the retail park on the day the fine was issued. But the lack of cameras and the fact the car park is unrestricted suggest otherwise. Mrs Clanchy did, however, also shop at stores at the London Road junction with Faraday Road – where Vehicle Control Services Ltd does have enforcement signs and cameras. The fine – which offers the inducement of a reduction to £60 if paid promptly – is accompanied by photographs of Mrs Clanchy’s car. It claims she arrived at the retail park at 9.53am and did not leave until 1.18pm. But, even if this refers to the stores near Faraday Road, the Clanchys say this is inaccurate. The Clanchys had been shopping that day at Dunelm Mill, at the retail park and initially felt that they had been misled about free parking advertised on its website. Vehicle Control Services Ltd declined to discuss the matter, but asked for any queries to be put in writing. Newburytoday.co.uk’s sister publication, the Newbury Weekly News, did so but the firm has not responded. A controversial pay and display system that has caused chaos in Perth is to be installed in a second car park. The Mill Street car park, near Marks and Spencer, is operated by Smart Parking, the same firm that runs the Kinnoull Street multi-storey. This year the company changed its pay and display machines to a type requiring drivers to enter their vehicle registrations when buying a ticket. However, dozens of motorists have been caught out by the system – with one motorist receiving a ticket after confusing the number 0 with the letter O and another penalised despite leaving 40 minutes early. Councillor Alexander Stewart, who has received many complaints about the Kinnoull site, said the firm is failing to listen to users. He said: “I am horrified that Smart Parking has paid no attention to the concerns that have been raised by numerous individuals, businesses and the council regarding this system, which was recently introduced at their Kinnoull Street facility. “They now seem to be pushing forward to introduce this at another car park, which I expect will have similar consequences for their customers. “The company has obviously learned nothing from the numerous complaints and seems to care even less. However, a spokesman for Smart Parking said motorists are continuing to use the Kinnoull Street site and the system has prevented people parking without paying. He said: “Smart Parking can confirm that it is upgrading the pay and display system used at the Mill Street car park. “The new system is similar to the one that was recently installed at the Kinnoull Street car park, and which is widely used across Scotland and the rest of the UK. “Since the new system was installed we have seen no decline in the number of motorists using the car park. “Historically, at Kinnoull Street, there was a serious issue of people parking but not paying, which simply wasn’t fair on those people that did. A FAMILY who stopped for six minutes in an Exeter car park to ask for directions have been handed a £100 fine for failing to pay for parking, even though they say they weren’t stopping. Paul and Samantha Jackson were on their way to catch a flight at Exeter Airport on April 24, at 5.45am when they drove their family car into a car park operated by Premier Park of Exeter. Mr Jackson said: “On approaching Exeter Airport at 5.45am, I did not want to stop the car on the main road (which was heavy with traffic) to get paperwork out of the boot of the car pertaining to the booked car park, because of having two children in the back seats. I pulled into what I thought was the correct car park. After my wife got the paperwork from the boot, I went to see the security guard in the car park to enquire if we were in the correct car park, and he told me I was in the wrong place and gave me directions to the correct car park. The couple from St Austell contacted the company in writing to point out why they briefly stopped at the car park but Premier Park rejected their reasons and insisted they pay the amount. However Mr Jackson has the option of making an appeal but he strongly feels that the fine is unjust and unnecessary. When the Express and Echo contacted the parking firm they declined to give a written reply but instead suggested Mr Jackson appeal. They also indicated there are large signs at the car park warning motorists of their terms and conditions of entry. The company also rejected the idea Mr Jackson had stopped to ask for directions but did park for a short time as caught on their CCTV. A motorist who was left queuing to get out of a car park for THREE HOURS was left fuming when she received a £70 parking ticket through the post days later. Dionne Russell says she was trapped in Coventry's Central Six retail park because the traffic was gridlocked. The 46-year-old spent 40 minutes shopping and then says it took her three hours to get out of the car park, the Coventry Telegraph reports. That tipped her over the three hour limit for parking and meant she got an automatic fine through the post. The good news is that millions of parking tickets are actually issued illegally, and you might be able to get yours cancelled. Failing that, if you think you've been ticketed unfairly, you can appeal - most are upheld - this is how. Ms Russell, who lives in Radford, Coventry had gone to Central Six on her day off work on May 14 to get some last minute items before she went to visit her fiancee in Germany. She said: "I had only gone to get some yarn for my crochet. I was going to be visiting my fiancee in Germany and wanted something to do for when he was working." The finance manager, who works in Nottingham, said: "It took me longer to get home from there than from Nottingham." Ms Russell was hit with the notice after licence plate recognition cameras used to police how long visitors to the retail park stay clocked her car stuck in traffic as she was leaving the site. She said: "I actually spent around 40 minutes shopping. We were clearly queuing." The traffic was so bad because of a combination of nearby roadworks and a broken down vehicle on the ring road. Dionne, who is in recovery from cancer, said she had been left stressed by her whole ordeal. She said: "It was so stressful I'm in recovery from cancer and try to avoid stressful situations. "People were really irate and shouting and it was unpleasant. In the queue people were trying to force themselves in front of me. "In the end I let one in as it was really stressing me out. A lady was banging on people's windows and complaining to anyone letting anyone out and asking those pushing in to join the back of the queue. "As I was feeling stressed I told her I didn't deliberately let anyone in just didn't want to become aggressive as it wouldn't help the situation." She described how it took police intervention to get the traffic moving again. She said: "I would have been stuck for much longer had the police not took control of the traffic on the main road to let people out." "I will be contesting the fine and definitely will not be paying it. I will never go back to that retail park again. "There must be so many people in the same boat." G24, the company which issued Ms Russell with her parking fine, were contacted about the case. A spokesman for firm said: "We have no comment. We will have to wait for the appeal to come through so I couldn't pass comment yet." YEOVIL District Hospital has done a U-turn on its unpopular car park payment system. The new rules brought in earlier this year – requiring patients to remember what time they entered the car park when they pay – have now been scrapped. Criticisms included accusations that the system installed by private company ParkingEye was expensive, confusing and likely to catch drivers out. It has recently been replaced with a more familiar 'pay and display' set up. A spokesman for the hospital said: "We implemented a simpler pay and display parking system at Yeovil District Hospital in response to public feedback that the new ParkingEye system was confusing and over-complicated. "We also opened an additional car park, P2, earlier this year, to give people further options for parking, and removed the parking barriers to ease congestion for queuing traffic and emergency vehicle access." ParkingEye said the system installed in January – which uses number plate recognition software to log customers on their way in, but requires them to remember the time – worked well at other hospitals. But feedback the Western Gazette's social media pages suggested the system was very unpopular. One man approached the Western Gazette after he was issued with a penalty notice after his car was seen arriving at the hospital and then leaving again 30 minutes later. William Usher said he is a blue badge holder and was looking for a free space in one of the disabled bays. But when he could not find a space he drove around the block again to see if one became free. He did this a couple of times before a space became vacant, and parked in a free space, but was later slapped with a fine for failing to pay because his car had been clocked arriving and leaving by the ParkingEye cameras. A spokesman for the hospital said: "We were sorry to learn of Mr Usher's parking fine. The two 20-minute drop-off zones, in front of the main entrance and the Women's Hospital, are monitored by ParkingEye, an automated number plate recognition system. Blue badge holders parking in these zones are required to register their badges at reception, which can be done at any time during their visit. Badge holders parking in P1 and P2 are not required to register their badges, provided they display them clearly in their vehicle. "We would like to apologise to Mr Usher if it was unclear that he needed to register his badge to qualify for free parking in the drop-off zones and would invite him to contact our Patient Experience team who will be happy to cancel his fine with ParkingEye." The spokesman added: "We are committed to continually improving and updating patient information about our hospital parking. To this end, we are actively seeking outdoor volunteers to join our team who will be on hand in the car parks to explain the parking system to those that need help. "We are committed to providing an easily accessible, clear and fair parking system at our hospital and invite anyone experiencing any problems to get in touch with our Patient Experience team on 01935 384 706 or email pals@ydh.nhs.uk." AN ANGRY dad has hit out over a “ridiculous” parking fine he says was issued simply for spending “about 10 minutes” in a retail park. Robert Garwood, 25, claims he visited Thomsen Retail Park, in Wessington Way, Sunderland, twice on December 30, last year. Mr Garwood, from Pennymoor Square, Pennywell, Sunderland, says that on each visit he stayed for about five minutes as he picked up meals from two fast food drive-throughs. However, within a week he received a letter from ParkingEye, who monitor the site, handing him a £100 parking fine. The maximum stay on the site is one hour, and the letter from ParkingEye stated Mr Garwood had been there for four hours and 35 minutes, between 3.36pm and 8.11pm. After refusing to pay the fine, Mr Garwood, who lives with girlfriend Rachel Spence, 23, and their son Jayden, two, faces the prospect of being taken to court. He received another letter from ParkingEye in February stating that, if the £100 was not paid within two weeks, court proceedings would be issued, incurring further costs. However, Mr Garwood is determined to continue to fight the action. He said: “I went into McDonald’s at about 3.30pm to get my son some food, and then went home. “I went back to the retail park just after 8pm to get food for me and my girlfriend from KFC, and again I used the drive-through, so went straight back home. “I later received a letter from ParkingEye saying I was being given a £100 parking fine, which of course I contested, but the legal process is still continuing and they are trying to take me to court over it. “I’ve responded to the court, telling them why I won’t pay the fine, and I was asked for proof I wasn’t there for that length of time. “I sent them a receipt to prove when I went into KFC, but they say the case is still being pursued. Mr Garwood has now called on ParkingEye to drop their case against him, and take note of the evidence available. He added: “If they reviewed the CCTV footage, they would see me going in and out at the times I said I did. “There would be no need for me to stay there for the length of time they say I did. ParkingEye did not wish to comment when contacted by the Echo. SIR - I should like to draw your attention to the 3 hour parking restriction enforced at the ASDAstore in Worcester city centre. Do not rely on the time printed on your ticket purchased from the machine upon parking. I have learned to my cost that the 3 hour timescale commences upon driving into the car park entrance where your car registration is photographed and stored by computer system. This fact is important if, like me, you often shop at the weekend where a large queue usually forms resulting in a delay between entering the car park and finding your eventual space on level 6. Relying upon the printed receipt time may result in a letter from Smart Parking and a demand for a £30 fine. A PENSIONER has issued a warning after winning his battle with a multi-national car parking firm over a trip to Preston’s Asda store. Keith Prowse, 71, went to Fulwood Asda to do some shopping on March, 26 and returned later to get some petrol and pick up a prescription. But to his horror he received a letter from Smart Parking Ltd two weeks later demanding £70 and accusing him of overstaying the supermarket car park’s three-hour parking limit by an hour. The fine has been overturned and Smart Parking said the reason for the letter was a security camera which misread Keith’s numberplate. A Smart Parking spokesperson said: “Due to the placement of the registration fittings, the C in Mr Prowse’s vehicle registration plate was read as a G.
“Asda contacted us about this case and we have now cancelled Mr Prowse’s charge. But Keith said: “The machine has read my number plate four times. Fortunately for Keith he kept all of his receipts and could prove he had driven back to his house in Fulwood. He said: “The CCTV image shows me entering the car park at 10.03am which I did and then the exit picture shows me leaving at 13:54 which I didn’t. After shopping I left at 10.30 and my phone records show I was at home at 10.53 because I made a call to my wife.